Sampling at 5GSa/s with a standard record length of 250Mpts/channel, this series includes the first 1GHz oscilloscope made by Siglent. The SDS5000X's impressive waveform capture rate is up to 480,000 frames/sec with multiple powerful triggering modes. Saelig Co. Inc. announces the new economical, high performance Siglent SDS5000X series of advanced digital storage oscilloscopes, which are available in 2 or 4 channel versions with bandwidths of 350MHz, 500MHz, and 1GHz – Siglent’s highest yet. With a maximum sample rate of 5GSa/s, these premium scopes offer a maximum record length of 250Mpts to allow for deep memory investigation of glitches and infrequent events, and they also have the option of 16 digital channels for true mixed signal analysis. The SDS5000X series has a maximum waveform capture rate of up to 480,000wfm/s in Sequence Mode. Visibility of waveforms is enhanced by a 256-level intensity-grading display function with a helpful color temperature display mode. The large 10.1’’ capacitive touch screen supports highly efficient multi-touch gestures, and a user-friendly single button feature for many commonly used functions. This greatly enhances the operational ease of the SDS5000X series of instruments. An external mouse and keyboard can also be connected to add to their navigation and notation capabilities. The SDS5000X’s innovative digital trigger system offers high sensitivity and low jitter, with multiple powerful trigger modes that include serial bus decode triggering, as well as edge, slope, pulse, window, runt, interval, dropout, pattern, qualified and video (HDTV supported). History waveform recording, Sequence acquisition, Search and Navigate functions all combine to allow extended waveform records to be captured, stored, and analyzed. SDS5000X instruments are designed with an impressive array of measurement and math capabilities as well as extensive serial decoding of protocols such as I2C, SPI, UART, CAN, LIN, CAN FD, FlexRay, I2S and MIL-STD-1553B. The low background noise design supports a minimum setting of 0.5mV/div. A Digital Voltmeter is also included in the design for a visible indication of measured data. To add digital debug capabilities, there is an MSO option which adds 16 digital channels with maximum waveform capture rate up to 1.25GSa/s and a record length up to 62.5Mpts. An external 25MHz function/arbitrary waveform generator with built-in multiple predefined waveforms offers a useful signal source for test purposes. Multiple interfaces are provided: USB Host, USB Device (USBTMC), LAN (VXI-11, Telnet, socket, web), Pass/Fail, Trigger Out, 10 MHz In, 10 MHz Out, and VGA output. Remote control is also supported via SCPI commands, or by using a web browser to access the built-in web server via the LAN port. 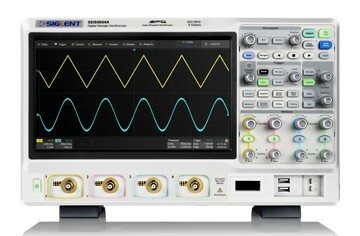 These oscilloscopes are made by Siglent Technologies, a leading high quality test equipment manufacturers, with a growing worldwide reputation. The SDS5000X series oscilloscopes are available now from Saelig, their USA technical distributor.